Discussion in 'Server Operation' started by mnewbegin, Jun 10, 2007. I have setup my server at work; it is going to be for mail/web server functions. I know I can change this but during the install it said to use localhost, localhost.domain.com and a few others for the name, to make sure mail sends correctly. My other problem is I am using webmin, I love it but everyone says it’s harder to configure than ispconfig, it looks so nice though and seems to do the trick. And point it to my IP address and my server will do the rest? I cannot receive mail to this box now because I have no incoming mail server configured. I have a static IP address, and can buy another if I need a second IP address. PLEASE HELP. I WILL TRY ANYTHING THAT WILL WORK. also what program should i use for a gui interface? squirrelmail ? and do you recommend postfix or other for this number of clients. 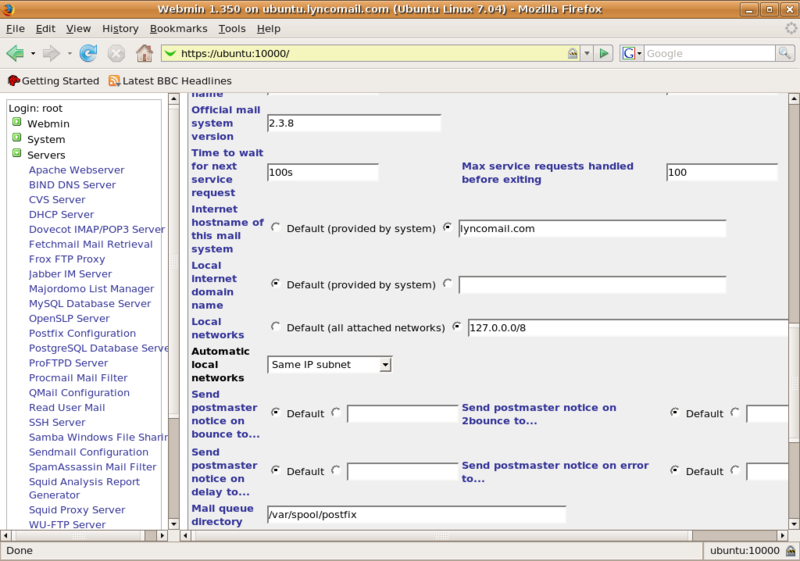 a step by step guide start to finish just configuring mailserver part would be excellent. You must set the correct sender address in your email client (e.g. Thunderbird, Outlook, Evolution,...). You don't need a second IP address. and do you recommend postfix or other for this number of clients. You can't go wrong with Postfix. Ive caught on to most of what I had to do for this stuff but im still lost, I started over with a fresh install. and then further down in the instructions I what do I use for. and other destinations to accept mail for? I have configured mx.domain.com to goto my ip address all ready. sorry some of the generic directions mess with my head during the setup, if someone posts an example just make a fake company name please. First you must make up your mind which hostname you want to use (e.g. ubuntu.yourdomain.com). 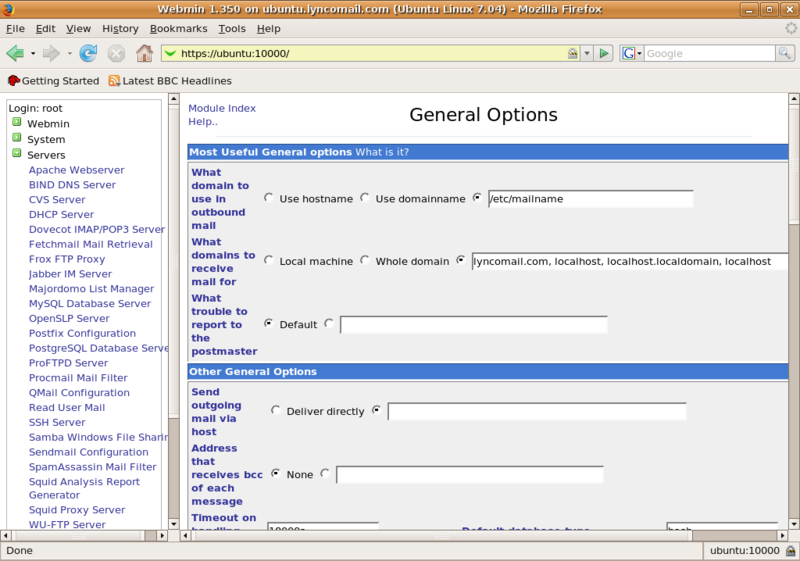 Then you simply replace server1.example.com with ubuntu.yourdomain.com. hopefully this will help me and others. here are screenshots of what I have. I will post any file needed here so i can get this working. I thought, a picture speaks a thousand words, so where could i go wrong. there has to be something wrong with my setup. mail goes out, but doesnt come in. I am running postfix, dovecot, im installing squirrelmail soon, and hopefully I will have this working today. I hope I have all the available ports and things open. I can do a clean install if i need to. The DNS records look ok (if 216.220.234.160 is your server's IP address).
? Any errors in your mail log? where do i find my mail log file? im kinda new to postfix sorry. what should that be set at at my situation? drwxr-xr-x 4 root root 4096 2007-06-19 13:26 .
drwxr-xr-x 119 root root 12288 2007-06-25 09:46 ..